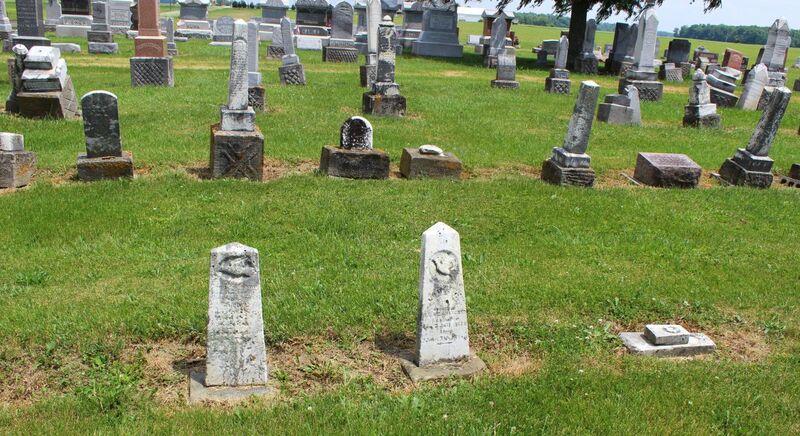 A few weeks ago, when I wrote the Tombstone Tuesday about the married couple John Christian and Mary Ann (Bollenbacher) Fisher, I mentioned that I had accounted for 8 of their 9 children. Now I believe that Georg Johann Fisher was their other child who I could not identify. Georg Johann Fisher’s tombstone is so weathered that it is illegible. Still, hoping to read the inscription on it, we went over to Kessler Cemetery one day last week and photographed it when the sun was shining directly on the face of the stone, but we still could not get a good reading. So I consulted one of the Mercer County Cemetery Inscriptions books, read at Kessler Cemetery in 1990. They were able to read the tombstone 28 years ago and the above inscription that I used is from that reading. His Find a Grave memorial also agrees with the inscription book. 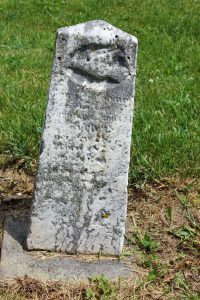 Although I could not find his birth or death recorded in Mercer County, there are several things that indicate that Georg Johann was probably the child of John Christian and Mary Ann. Two of John Christian and Mary Ann (Bollenbacher) Fisher’s other young children are buried next to him. Georg Johann’s tombstone is to the left (north). Louis C. Fisher (1874-1876) is buried in the middle and Carolina E. Fisher (1872-1873) is buried to the south. Carolina’s is the broken marker on the ground. Their parents are buried a few rows away. 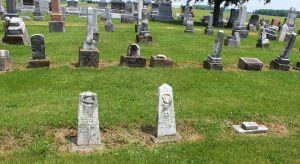 The three children died within a few years of each other and it would not be unusual that, as siblings, they were buried next to each other. All the markers are about the same size and they all have a flying dove carved into the top. The dove inscription was often used as a symbol for young children, indicating innocence and purity. According to the tombstone inscriptions, all three children probably had the same parents, John/JC and Mary Ann/MA. Unfortunately, I could only make out a few letters on the marker but the inscription was likely in German, like his two siblings’ tombstones. As calculated from his tombstone, Georg Johann Fisher would have been born 5 April 1878, the same day as his brother Adam John “AJ” (1878-1949). Twins! His mother had another set of twins two years later, Mary Elizabeth and William Michael, born in 1880. All three of these of the young Fisher children lived and died between census enumerations and very little is known about them.